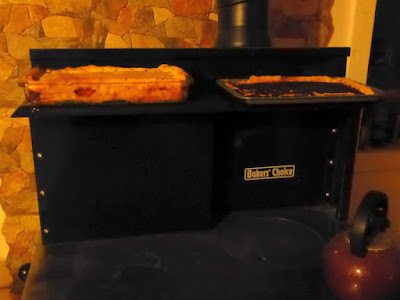 I am happily learning the art of woodstove cookery with our new Baker's Choice wood cookstove. I think I'm in love. So far this stove is amazing. It heats the whole house and -- get this -- uses half the wood our old antique parlor stove used. As far as I'm concerned, that in itself is worth the price. We're also using less propane since we're not using our propane stove as much. 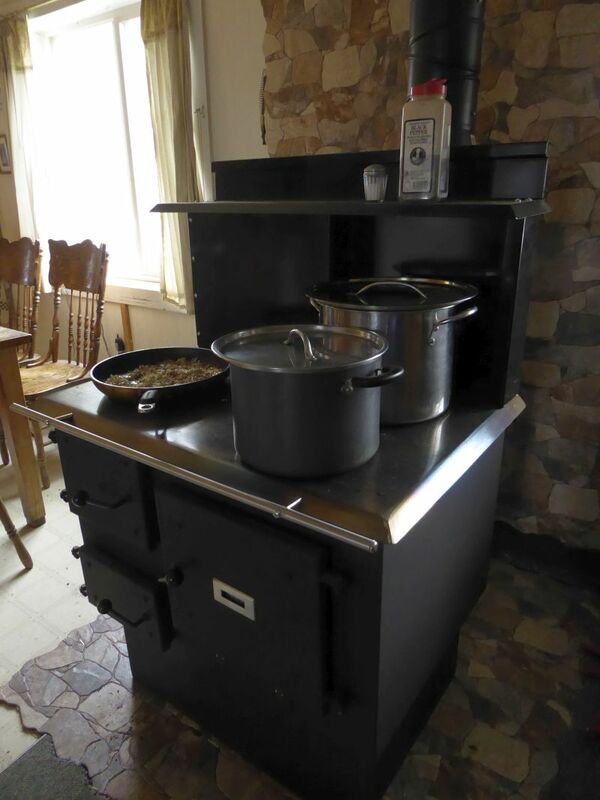 Since the wood cookstove is already heated anyway, we simply use it for cooking and baking. Being air-tight, the stove has a number of features letting us adjust things as necessary. 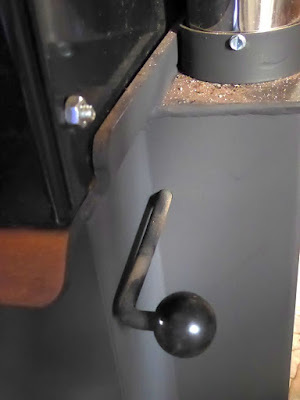 There are two knobs on the side which, when screwed closed, buttons things up for long-term slow heating (Don sets these before going to bed at night so the house is cozy warm in the morning when I get up). When we want a slow steady fire, the door stays closed. When we want a faster, hotter fire, we open the door a bit, which allows air into the fire box and really gets things rippin'. Using the stove's surface is simple. However I hadn't used the oven, and needed to start figuring that out. There is a knob in back to circulate hot air around the oven box. The knob goes IN when the oven is in use (our mnemonic memory aid: OV-IN -- oven -- get it? ), which diverts heat around the oven box before it goes up the stove pipe. 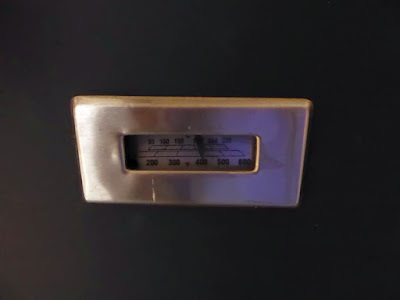 The oven has a thermometer, but so far -- and granted my experience is limited -- I'm learning it really isn't important (to an extent) what the temperature is. 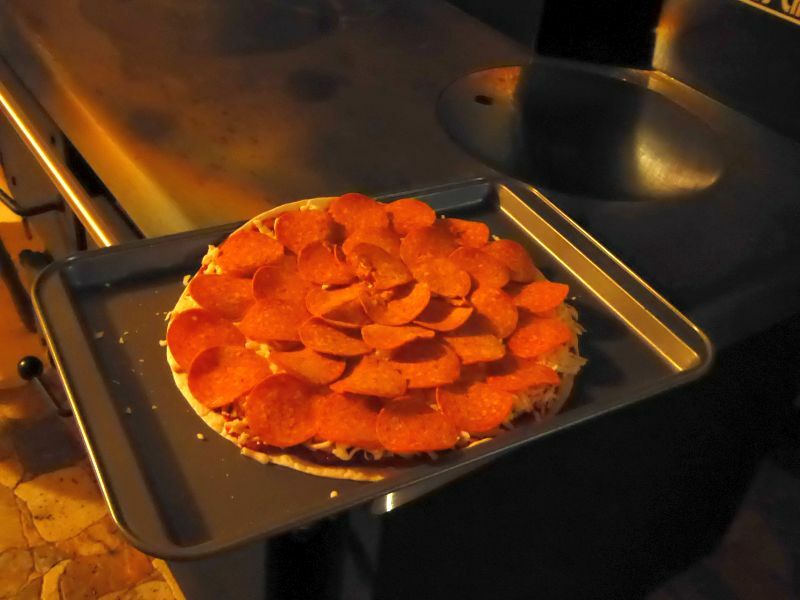 ...and tucked it into the stove. I didn't know how fast it would cook. I didn't know if I should rotate the tray to prevent one side from burning. 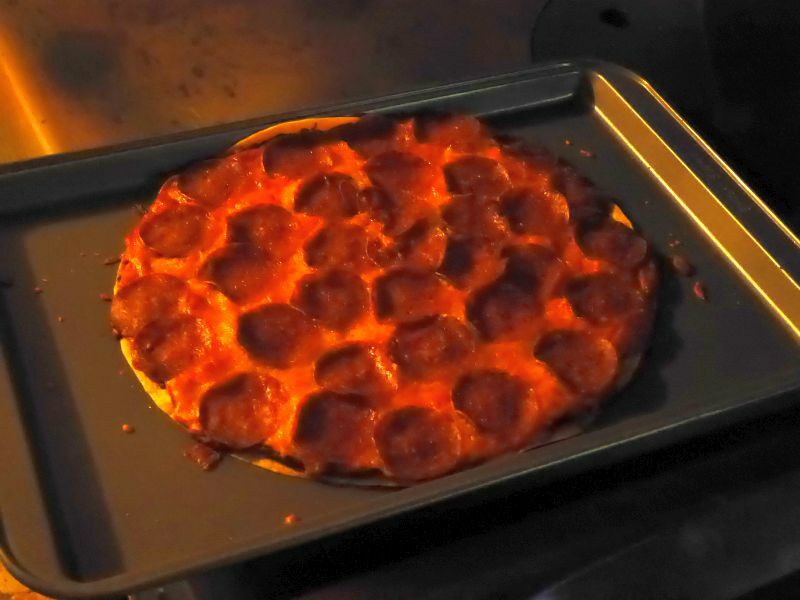 It cooked a bit slower then a regular oven, but I didn't have to rotate it at all. And it came out beautifully browned all over. In a conventional oven, particularly for some fussy short-bake foods such as cookies, temperature and timing are critical. One thing I quickly realized is this: time has no meaning to a cookstove. When it says on the recipe that such-and-such should be baked at 375F for 12 minutes, that doesn't apply to a cookstove, even those with temperature gauges. For example, I wanted to bake a large chicken pot pie for our neighborhood potluck. 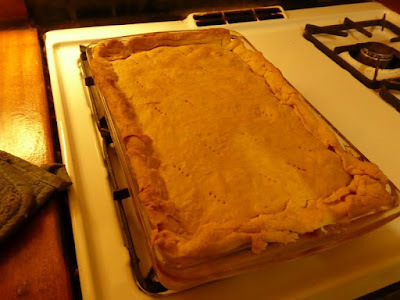 Just in case, I put the pie in early -- around 2 pm (dinner is at 6 pm) so if it was still half-raw by, say, 5 pm, then I still had time to bake it in our conventional propane oven. We didn't stoke up the fire any more than normal; we just let the pie bake at its own pace. As it turns out, it was done by 5 pm. Not just done, but beautifully done. The crust edges didn't burn (something I normally need to watch for in the regular oven), and it was an overall golden-brown. I was then tasked with keeping the pie warm until dinnertime. But this wonderful cookstove takes care of that. I simply put it on the warming shelf, and it stayed hot until dinnertime. Cookstoves call for thinking ahead. Some of our potluck guests like a cup of coffee after dinner. I put the full teakettle on the stove -- farthest from the heat source -- just as people started arriving. By the time dessert rolled around, the kettle was hot. Alternately, of course, I could have opened the damper and fired up the cookstove hotter, but the room was already warm and I didn't want to make anyone uncomfortably hot. 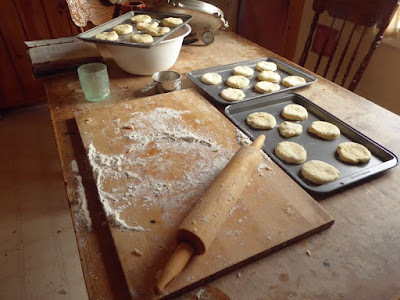 This morning I made biscuits for breakfast. 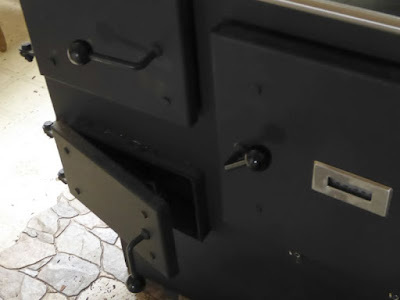 The cookstove oven is small and only has one wire shelf. I have three small cookie sheets that fit in the oven. 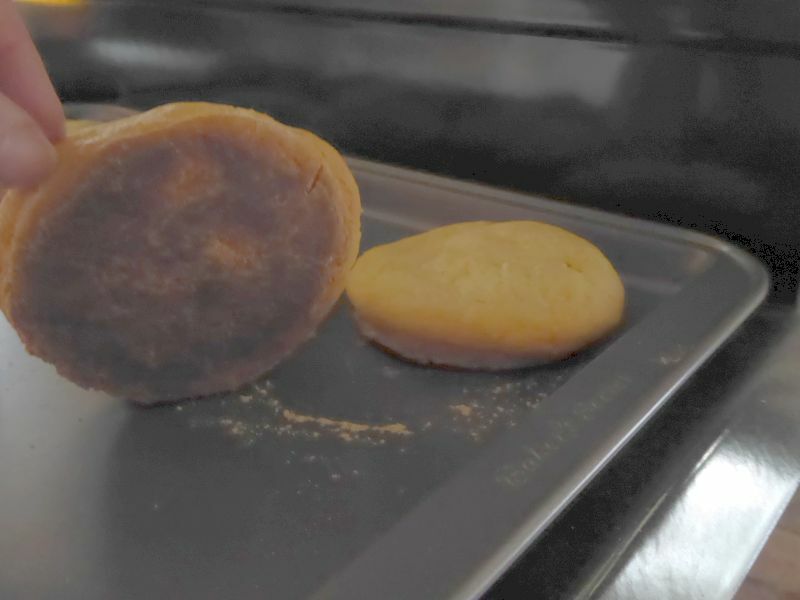 I put one on the shelf, one on the oven bottom, and one stayed out until the other biscuits were baked. 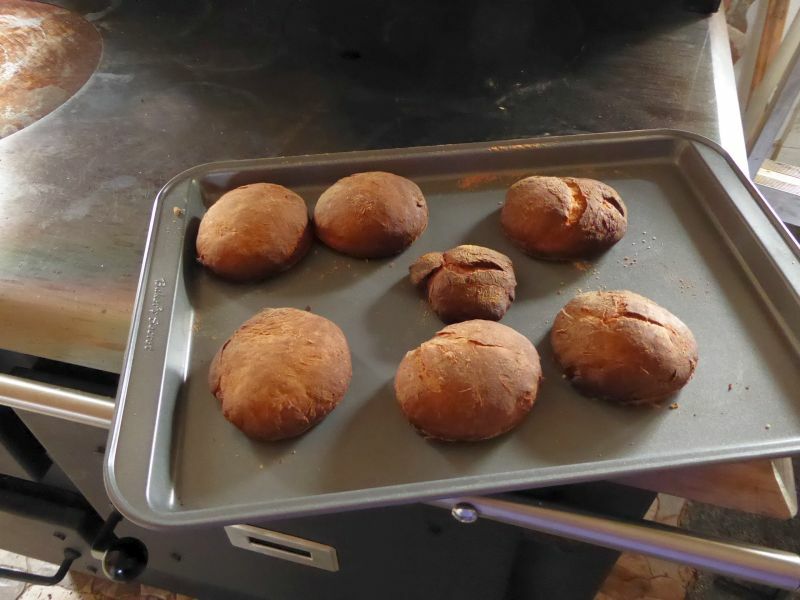 I didn't fire up the stove any more than usual, so the biscuits took about half an hour to bake. The sheet of biscuits that fit on the wire shelf baked beautifully. The sheet that I placed on the oven bottom caused the biscuits to get a bit too brown on the bottom. We ate them and they tasted fine, but I should have been more vigilant. The third sheet of biscuits -- well, I slipped them into the oven (on the wire shelf) and then clean forgot about them. Can't blame the stove for this; it's what is euphemistically referred to as "operator error" (otherwise known as a "learning curve"). I was enthusing to my brother about the joys of this new stove, expounding on its efficiency and utility. "I just LOVE modern technology!" I told him. It might sound silly to refer to a wood cookstove as "modern technology," but there you go. My statement stands. UPDATE: I forgot to mention something with regards to this cookstove and how we installed it. By itself -- just standing on the tile -- the cooking surface is only about 32 inches high. This is extremely comfortable for my short (5'2") frame. A taller neighbor (who has a Pioneer Maid, the next model up from this cookstove) commented our stove was set too low for him. His stove is on a platform, which makes cooking easier. For readers considering this stove, unless you're a shorty like me, you might want to install an elevated platform of whatever height to bring the cooking surface to a comfortable level. Now that's a beautiful looking stove! 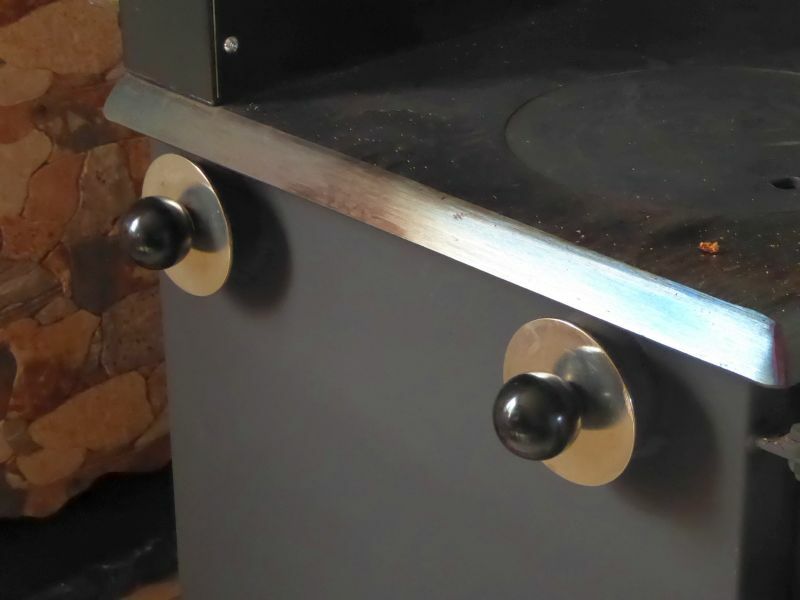 Thanks for all your info about the installation and use of your wood cookstove. The Baker's Choice is on my short list, and everything you share helps! Having never used a woodstove before, I appreciate your experiences. And being so efficient on wood is really going to help sell it to my husband! I wonder if putting a cake rack on the bottom of the oven would help keep the biscuits from burning. Or, cut the tops and bottoms of off 4 empty 6oz tuna cans and rest the baking sheet on top of them. Young lady, why are you not using a cast iron pan on that fantastic stove? Wow, what fun! The outcome of the fun looks tasty, too! already! Keep us up to date on your future cook stove adventures! Beautiful stove! Ours is simply a cute little glass door wood stove and I've not tried cooking on it yet. The surface is much much smaller than our old stove so it could get tricky. I am thinking about trying to create a state allowing me to bake under the stove, on the concrete floor . .
You are well on your way to mastering this masterpiece. It is beautiful, and so functional. An aside regarding creosote buildup: Like Steve mentioned, I too am cautious about air-tight wood stoves and the potential for creosote buildup. I lived in Maine for 20 years and witnessed some frightening chimney fires. And they burn nothing but prime cleaner-burning hardwoods (oak and maple), not the softer woods we have in the Pacific Northwest. For what's it’s worth, using any woodstove I like the idea of once-a-day, getting a stove warm (to minimize stressing steel/cast iron), then running a HOT fire through it with the damper wide open for a couple minutes. If there is any unburned creosote in the stove pipe and/or chimney, it should burn and become a flaky or porous non-combustible. This material can be easily loosened and removed with regularly scheduled chimney cleanings using a tight-fitting chimney wire brush. Essentially you are creating a daily 'chimney fire' but it will be minor, controlled and harmless. Note: Having the damper open during this process may bypass some cavities (such as the oven heating cavity of cook stoves). One would have to determine the best method of removing creosote buildup from those areas. Grandma had a huge monster stove (I've seen cabins smaller) in a cookhouse out back where the canning and summer baking was done. There was a much smaller one in the house kitchen. That one you have keeps the whole house nice and cozy, but you won't be able to cook on it when the weather gets hot. Can you imagine leaning over it all day come August when it's time to can peaches and pears? 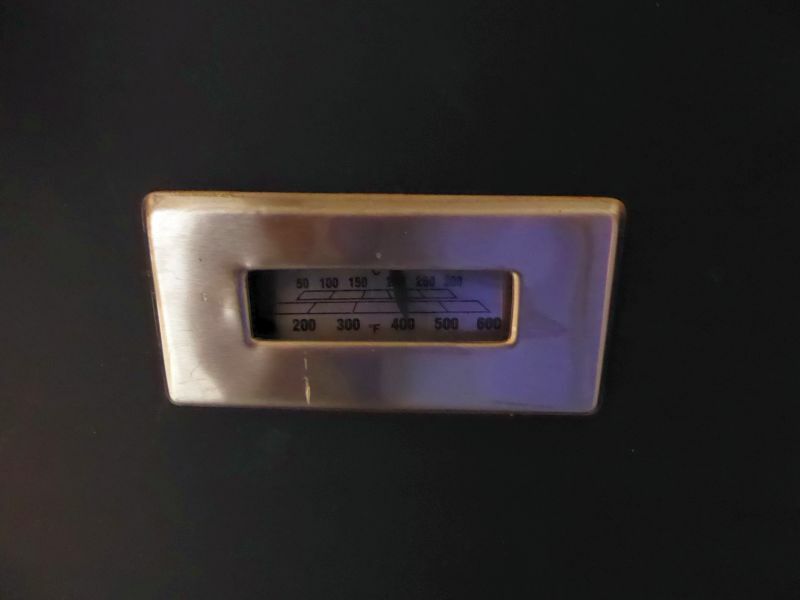 About the creosote: put a wood stove thermometer into the stovepipe. Mine is about a foot above the warming closet above my Pioneer Princess. Get its temperature to 400F or above at least once a day. That'll keep the creosote problem way down until your cleaning time. Hubby uses Pampered Chef stoneware in his antique wood cookstove. Cast iron on top. Or his Wok. view at http://www.sharpsaddles.com Cooks almost everyday (in the winter) in or on his stove. Bakes all bread/buns in it. Haven't bought a loaf of bread from the store in YEARS! We clean the wood cookstove once a week and do the pipe every other week. Part of life off-grid. There are 2 seasons ash and dust.! Jealous isn't the right word-- there's no point in putting such a tool in our current residence, the population density is too high-- but I'm still drooling. Fingers crossed and prayers said, hoping the whole tottering mess holds out long enough for us to execute the move to a place where such a tool would be more than spoils for post-event looters (if they could figure out how to use it). Congratulations, Patrice, she's a beauty. So's your "first" round of baking. Looking at that, I have to imagine you've already graduated from the Enola Gay College of Woodstove Cookery... or else you're just gifted! !